Under Sirisena, the country is trying to move from “victory” to “remembrance” of its brutal civil war. President Maithripala Sirisena’s commemoration of the sixth anniversary of the end of Sri Lanka’s three-decade civil war and the debate it has opened in local media show that attitudes on the war’s aftermath are now beginning to change, but that the pace of change is too slow to expect healing and reconciliation in the near future. For the first time since the end of the war six years ago, May 19 was marked as Remembrance Day. Sirisena’s predecessor, Mahinda Rajapaksa, celebrated it as Victory Day during his presidency, rubbing salt into the wounds of ethnic Tamils, who suffered tens of thousands of civilian losses during the fighting between the Sri Lankan military and the rebels if the Liberation Tigers of Tamil Eelam (LTTE). Rajapaksa’s regime also held a “victory parade” on each anniversary, and erected numerous “victory monuments” in the largely Tamil-majority northern and eastern parts of the country. For the former president, it was not only the victory of the army under him, but also that of the majority Sinhalese people over the ethnic minority. Sirisena, who was health minister in the former Rajapaksa government, made a departure of a sort by changing the name of the anniversary’s commemoration, although he has tried to have it both ways, carrying on with a military parade on the anniversary, allowing the military as well as Sinhala nationalists to continue to see it as the celebration of the nation’s strength and sacrifice of troops in the war. At the same time, Sirisena has made enough room for ethnic Tamils to commemorate those civilians who lose their lives. This was clear when Cabinet spokesman Rajitha Senaratne told local media that May 19 would be a War Heroes Commemoration Day as well as a civilian Remembrance Day. As might have been expected, Rajapaksa ignored this dual strategy, and reacted, saying, “I would like to say this to those who prevented the war victory from being celebrated – take revenge from me if you want,” as quoted by the Sinhala-language Rivira newspaper on May 19. Meanwhile, the response among Tamil groups was mixed. One civil society group, Aluth Parapura, which supported Sirisena during his campaign for president last year, observed May 19 as Brotherhood Day in Colombo. They held a vigil to promote the idea that the end of the war should be a day to commemorate brotherhood, and not celebrate victory. 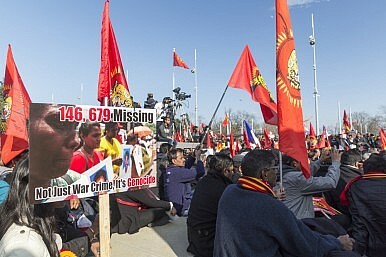 Sinhala nationalists appaeared to be a little cautious of the idea of a “Remembrance Day,” but their main reservation was about comemorating the death of Tamil rebels. Apart from Sri Lanka’s two nationalist publications, Divaina and Rivira, almost all newspapers avoiding making “victory” a central focus, according to Verite Research, which also noted that most newspapers echoed “the state-led reconciliation rhetoric.” Indeed, the government attracted little criticism for “replacing” the triumphalist approach of the Rajapaksa government. Sirisena’s government has brought some visible change in the nation’s political and social atmosphere, but its ambiguous, dual approach must end soon. A much louder and clearer policy is needed to restore the lost confidence of the Tamil population and achieve the reconciliation that Sirisena promised when he asked for votes from the Tamils. Western countries are less interested in pressuring Sri Lanka now that Rajapaksa is no longer in charge.